Here is another quick chicken and pasta dish. This might be my favorite one so far! I absolutely loved the flavors in this dish. The sauce is a combination of Alfredo and tomato sauce. It was so creamy and flavorful. I seriously could eat this dish every week. I marinated the chicken before work, and Chicken Legs grilled it when we got home while I made the pasta. Dinner was ready in a flash! If you don't have a grill, you can cook the chicken on the stove. Pan sear the chicken in olive oil for 2 minutes on each side and finish it off in the oven at 400 for 10 minutes. This is a super easy and super delicious weeknight meal! Marinate chicken according to packet directions. Grill 12-15 minutes, until chicken is no longer pink. Set aside. In a large pot, combine Alfredo sauce, tomato sauce, Italain seasoning and garlic. Heat over medium-high heat for approximately 10 minutes. Toss in cooked pasta. 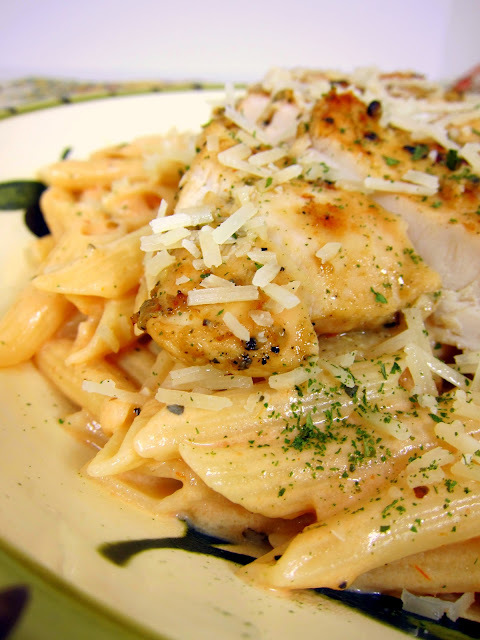 Slice chicken and serve over pasta. Top with parmesan cheese if desired. Oh my goodness, this looks so delicious! Best of all, it seems super easy to make. Will try this recipe. Love the Grill Mates from McCormick! What kind (brand) of Alfredo sauce do you use when you make this? I need to use the rest of my Grill Mates packages, those things are good. Grilled chicken is such a flexible ingredient isn't it? Can I use minced garlic instead of a garlic clove? If so, how much should I use? Amy - you can use a garlic clove and press or crush it. I made this tonight and it was DElicious ! Loved the marinade on the chicken and I actually cooked the chicken perfectly for a change. I used El Pato sauce for the tomato sauce which gave it a spicy kick that we liked. Will make it again and thanks so much for sharing it ! In case anyone has never used the marinade before, please note there is a fairly strong herb taste... for those who ate it tonight, we weren't able to pinpoint what it was, but it was overpowering. The tomato Alfredo sauce was delicious. If I were to make this again, I would probably use half a packet of the marinade in the future and try it that way. On a side note, I've tried a number of your recipes, and many of them I've made multiple times because they were a huge hit in my house. I love your site, you have so many great recipes here!